We are an all-volunteer IRS charitable nonprofit. As an all-volunteer organization, we are able to keep our overhead costs to about 10%. (Most U.S. nonprofits average 30-35% overhead cost.). That means ninety percent (90%) of your contributions to Caring Clowns International go directly to support children. 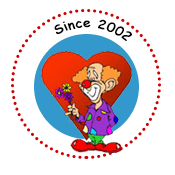 We clown for donations (which may be tax deductible within the scope of IRS regulations). So, we are much less expensive than commercial clowns, and every bit as professional, and the majority of your donations goes to help children in need in the U.S. and developing countries. Please fill out the Contact Us form and we will be delighted to chat with you about your event and plan for a giggle of clowns to funny up your affair!! !